Canada who gather four times a year for a one-hour meeting, to learn about local charities and non-profits. Every attendee donates a $100 check to a charity of which that the group selects at that meeting. This combined donation of $10,000 makes a real impact, without time-consuming fundraising events and planning. Chelsea Hill, Founder & Director, will be bringing us the inside information as to how we might attend or promote a favorite local non-profit or charity at a meeting. Chelsea says “She is astonished and thrilled by the enthusiasm of our Maui women. “Over and over again, women tell us how the 100+ Women Who Care Maui alliance is simple, brilliant, inspiring, and effective.” Since December 14, 2014, this group has collected thus far $103,806. 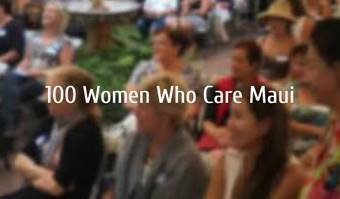 100 Women Who Care was started in November of 2006 by Karen Dunigan of Jackson, Michigan, as a brilliantly simple way to raise money efficiently and quickly for local charities. These groups collectively have donated more than a million dollars to locally based organizations. Chelsea Hill will be sharing several stories of hope and success since she began serving our Maui community. She’ll be updating us on the progress of this group, sharing stories of the successful roads that they have helped pave for Maui’s local non-profits and she will tell us about the next meeting so others can be inspired to give funds to their local non-profits keeping funds local.